All student records for health and personal information are kept secure and private and maintain compliance with the Health Insurance Portability and Accountability Act of 1996 and Family Educational Rights and Privacy Act of 1974. Mrs. Colleen O’Brien, our school counselor, serves the needs of the St. Thomas More Catholic School student body, and their families through classroom teaching and individual consultation. The counselor is on campus 20 hours each week. Parents or students may also contact the counselor by email. Out of the ordinary events happening at home can greatly influence your child’s disposition. If would be helpful to inform the teacher and counselor about unusual experiences (ex. sleepless nights, loss of pet, visiting grandparents) so that we can be sensitive to your child’s needs throughout the day. Mrs. Emily O’Brien, our school nurse, can be reached by email or 919-942-6248. We are able to provide first aid, CPR, and some EMT services on campus at all times. We are bound by the same immunization and health code policies as the state and county. Students who require any special physical accommodations must have a note from a doctor indicating the need; for example, use of the elevator or not participating in PE or recess. Parents will be notified by the nurse/school office when a student is too ill to remain at school. Any student with a temperature of 100 or above will be sent home. Parents will be called to come to the school and take their child home. If parents cannot be reached, we will utilize the supplied emergency contact numbers, and then local emergency health providers if necessary. If at any time the school nurse or a supervising adult judges that there is an imminent and significant threat to health or safety due to a child’s condition, 911 will be called concurrently with parent contact. NOTE FOR PRESCHOOL AGED CHILDREN: Even if a child does not have a fever, vomiting or diarrhea, understand that any child with a sore throat, excessive runny nose, rash, nausea, earache, chills, severe headache, discharge or irritation of the eyes, or persistent cough cannot play comfortably and may expose other children to illness. Please keep your child at home if they have these symptoms. Parents are required to notify St. Thomas More School administration of any allergies or life-threatening health conditions during registration or re-enrollment. Families will be notified if a student with severe allergies is in their child’s class. Students with life threatening medical conditions must provide written documentation to the nurse and the student’s teachers. All specific health needs must be listed on the student’s health information form, which is included in the registration/re-enrollment packet as well as the following forms in RenWeb. If the school nurse establishes that a student has live head lice, the nurse will contact the parents to discuss treating the child. Students are not able to return to school until lice and nits are no longer present. All students attending St. Thomas More School must be in compliance with North Carolina State law and regulations regarding immunizations. Immunizations are generally due for Pre-Kindergarten, Kindergarten and 6th grade students. More information on the state requirements can be found here http://www.immunize.nc.gov/schools/kindergarten.htm . 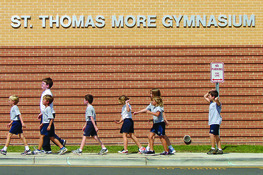 The school assumes no responsibility for the effects of medication when it has been properly administered, and, with the completion of the form, parents release St. Thomas More School and their employees and agents from any and all liability that may result from a child taking the named medication according to the written instructions given by the parent. In case of an accident or illness suffered by a student during the school day, every attempt will be made to notify the parent/guardian. If parents/guardians cannot be reached, one of the emergency contacts designated on the emergency release form will be contacted. If first aid is required for an injury, the child will be sent to the nurse’s office for assistance. If a doctor’s attention is indicated and parents are not available, school personnel will use the authorization given on the emergency release form in order to ensure that the student receives necessary emergency care. This form must be updated throughout the year for any changes. It is understood that all children in the Three-Year-Old and Pre-Kindergarten classes are fully potty-trained during the daytime hours without the use of “Pull-ups.” Managing toileting needs independently will help your child build self-confidence and feel successful.